AHB demonstrated that short-rotation hybrid poplar trees are an excellent feedstock for making drop-in transportation fuels and bio-based chemicals. Drop-in fuels are directly compatible with the existing transportation infrastructure and are an alternative to petroleum-derived gasoline, diesel, and jet fuels. Building upon ZeaChem’s technology for producing ethanol from wood, AHB developed the conversion process all the way to biojet fuel. 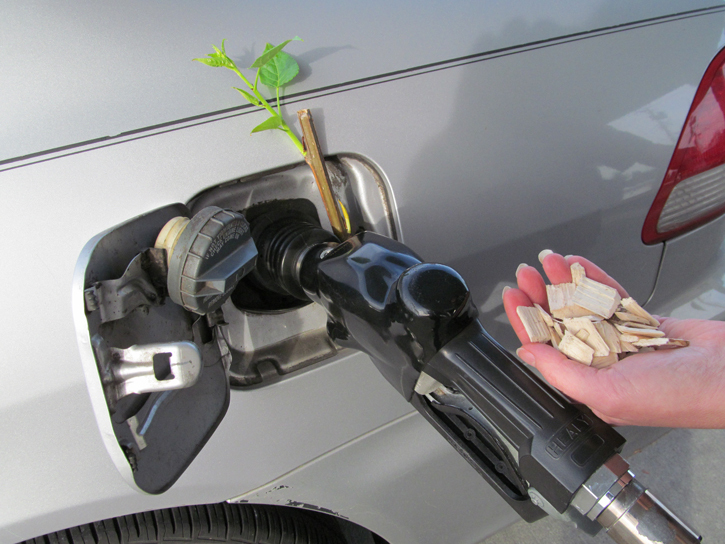 To make biofuels from non-edible plant parts (e.g., corn stalks, wood), the important ingredient is sugar. AHB’s process converts poplar trees into drop-in transportation fuels by extracting sugars from wood chips, turning the sugar into alcohol, removing water molecules, and building large hydrocarbon chains. Along the way to drop-in fuels, the process generates acetic acid, ethyl acetate, ethanol, and ethylene. There are other methods that can produce different chemicals, like lactic acid. Building a bioeconomy upon high value chemicals and bioproducts may help overcome economic barriers, forming the bridge to biofuels in the Pacific Northwest.